JUNEAU — Even if it doesn’t have all the money in hand, the Municipality of Anchorage will begin construction on the first phase of the Port of Alaska replacement project next summer, Municipal Manager Bill Falsey told state lawmakers in a Thursday hearing of the Senate Finance Committee. The port, built in 1960, needs to be replaced within 10 years, estimates indicate. The cost of replacing the entire port has been estimated at $1.9 billion, but given a lack of funding, anything beyond the first phase is out of reach, Falsey said. He was invited to speak to the finance committee by Sen. Natasha von Imhof, R-Anchorage. “I think it’s an important piece of infrastructure that serves our whole state. I think it’s important to keep this Legislature (apprised) of the activities of the port,” von Imhof said by way of explanation. Even if the state can’t contribute financially, lawmakers might be able to contribute ideas to the port project, she said. That would require residents of the municipality to shoulder the financial burden of a project that benefits much of the state, not just Anchorage. “I suspect it would be very challenging to convince municipal residents to vote for a sales tax to rebuild the port,” Falsey said. Instead, the leading option to pay for the port project — barring sudden federal aid — is a new, higher tariff on goods that pass over its piers. 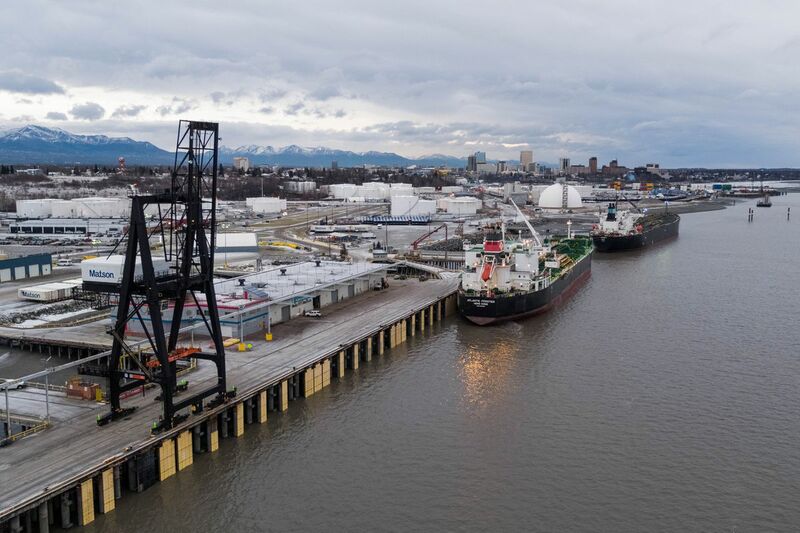 According to a report published in February, the port currently charges a tariff of 0.38 cents per gallon for petroleum products shipped through the port. Those rates would need to be increased by 45 percent per year until 2023 — when they would reach $1.01 per barrel and 2.4 cents per gallon — to cover the debt service on $200 million in bonds. For cement, the tariff is $1.61 per ton. It would increase 39 percent per year and hit $8.30 cents per ton in 2023. “The tariff is a better fit. The tariff hits the users,” Falsey said. He added that the municipality is undertaking an economic feasibility study to determine the side effects of raising tariffs. If aviation fuel prices rise too high, for example, Ted Stevens Anchorage International Airport might become a less-attractive stopover point for trans-Pacific airline freight. “Even potentially smaller changes to the price of fuel in Anchorage could have a significant downward effect on the volumes at the airport,” he said.